Fixmart supplied Mace's ductwork subcontractors with elements of their on site materials, required for the Met Police office refurbishment at 109 Lambeth Road. Fixmart supplied the ductwork subcontractors for Mace with elements of their on site material requirements at 109 Lambeth Road. This redevelopment project along with others such as Hendon and New Scotland Yard are designed to provide the Metropolitan Police with world-class facilities that will equip them for the changing requirements of a modern police service. 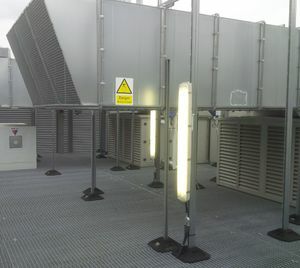 Some of the materials supplied to site included the anti-vibration rubber feet, channel and brackets to construct the support frames required for the roof top ductwork and risers. Deliveries were made to timed delivery slots. The works carried out by the sub contractors consisted of two office floor fit out’s and the installation of ductwork systems on the upper and lower roof areas. One of the office floors had to be finished to a clinically clean standard for laboratory use, which was reflected in the materials used. As the building remained occupied during the refurbishment this posed some challenges to the contractor, in order to help them overcome these we worked to timed delivery slots to ensure materials were available when needed.